Born to Play, originally a brand of Entertainment Rights plc, became a trading brand of Martin Yaffe International Ltd, a UK based toy company that went into administration in July 2010. 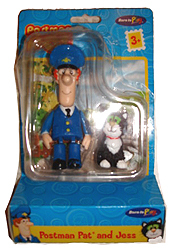 Before the licensing rights went to Character Options in 2008 a huge array of Postman Pat toys were designed and released under the Born to Play brand. Most of these were of high quality and many were quite innovative as well. 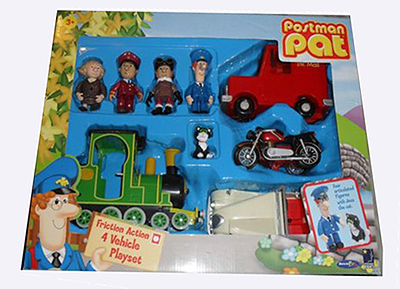 As a result you can find examples of the Postman Pat friction vehicles with both the ER and Born to Play flashes on the box, and later models with just the Born to Play flash. Born To Play Postman Pat Friction Van With Pat and Jess. This has a Pat figure in a fixed sitting position and a Jess with a hole in the base to locate inside the van. 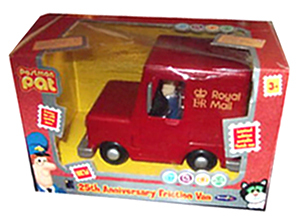 This Pat van was also released in a special Limited Edition version, the 25th Anniversary Friction Van, with glitter effect in the metallic red plastic coachwork to celebrate 25 years of Postman Pat. Born To Play Postman Pat Friction Off Roader With Amy the Vet. Postman Pat Amy and Pumpkin Playset. Amy Wrigglesworth with Welsh Pony ‘Pumpkin’ and Off Road Jeep with opening bonnet, doors and Horsebox Trailer with opening tailgate. As well as the friction vehicles Born to Play released smaller scale Postman Pat toys under the ‘Snap Trax’ brand. These are covered in a sub page of their own. As well as singly with the figures, the Friction Vehicles were also released in boxed sets. Born to Play made a Remote Control version of Pat 1. 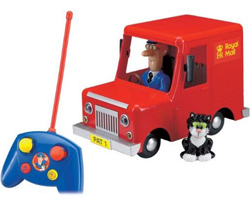 At least two distinct versions of the RC Postman Pat van were released with quite different remote control handset units, though the vans were the same. One handset had four control buttons and the other was simpler with only three, though both could play a tune and toot its horn as it made its rounds. The Remote Control Van Playset had several accessories including snap-together track, fencing, road signs and traffic cones. 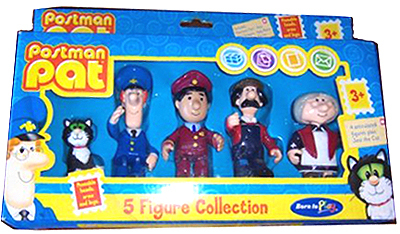 Born to Play also released their range of Postman Pat figures, single carded and in a set of five. The same figures were also released with the friction vehicles. The arms, legs and head on some of the figures have basic articulation. 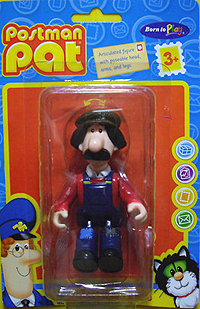 The single carded Postman Pat figure by Born to Play is far superior to the original fixed (non-articulated) ‘bendy’ seated-pose Pat supplied with the Pat 1 friction vehicle. 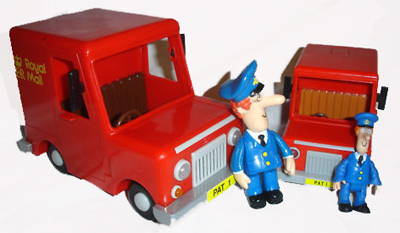 From 2010 Character Options released their own single carded Postman Pat figures but these are a smaller scale (2.5 to 2.75″ approx) than the older Born to Play figures which stand around 4″ tall. Born to Play did not confine themselves to action figures, they released also a 12″ scale plush ‘Walkin-Whistling Postman Pat’. 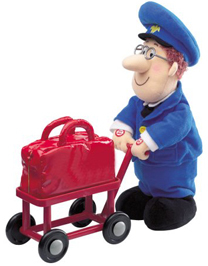 This was a soft toy Pat with red post trolley and mailbag which when activated by a hidden button on his right forearm walked along and whistled the Postman Pat theme tune for around 30 seconds. 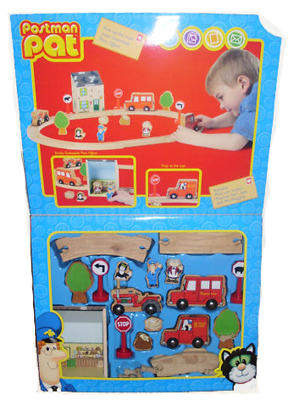 Born to Play also released a range of wooden Postman Pat figures and wooden playsets. These were available at outlets such as ELC The Early Learning Centre. Wooden figures of Postman Pat, Jess the cat and Mrs Goggins could be driven around the wooden track to the wooden Greendale post office. 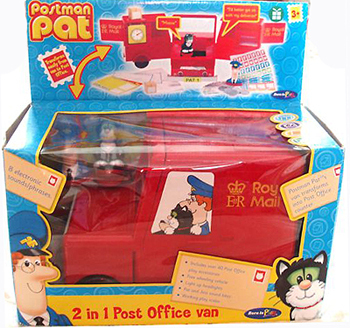 A rather innovative toy from Born to Play was the Postman Pat 2 in 1 Post Office Van which opened out from an ordinary looking free wheeling Pat 1 van into a post office playset. 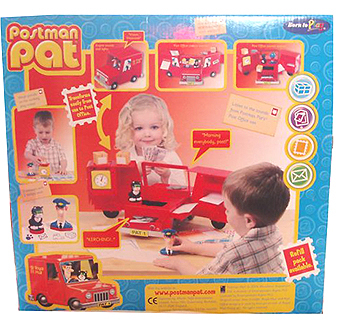 The 2 in 1 Post Office Van included over 40 Post Office play accessories including a working set of scales. Pat 1 had light up head lights and featured Pat and Jess sound effects. The Pat and Jess “stamper” figures could be used to frank the play stamps supplied. 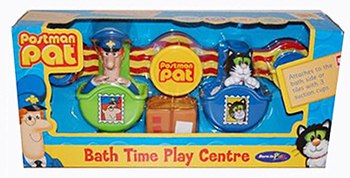 Another novelty item from Born to Play was their Postman Pat Bath Time Play Centre. This had two squirty Pat and Jess figures and three bubble making discs which attached by suction to the side of the bath. 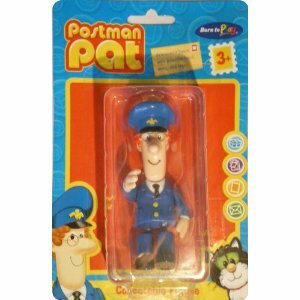 A classic toy, contemporized for the era of the licenced toy was Born to Play’s Postman Pat Hand Puppet and Theatre Set. With a hanging fabric backdrop you could act out favourite Postman Pat episodes with finger puppets of Pat, Jess, Ted and Mrs Goggins.